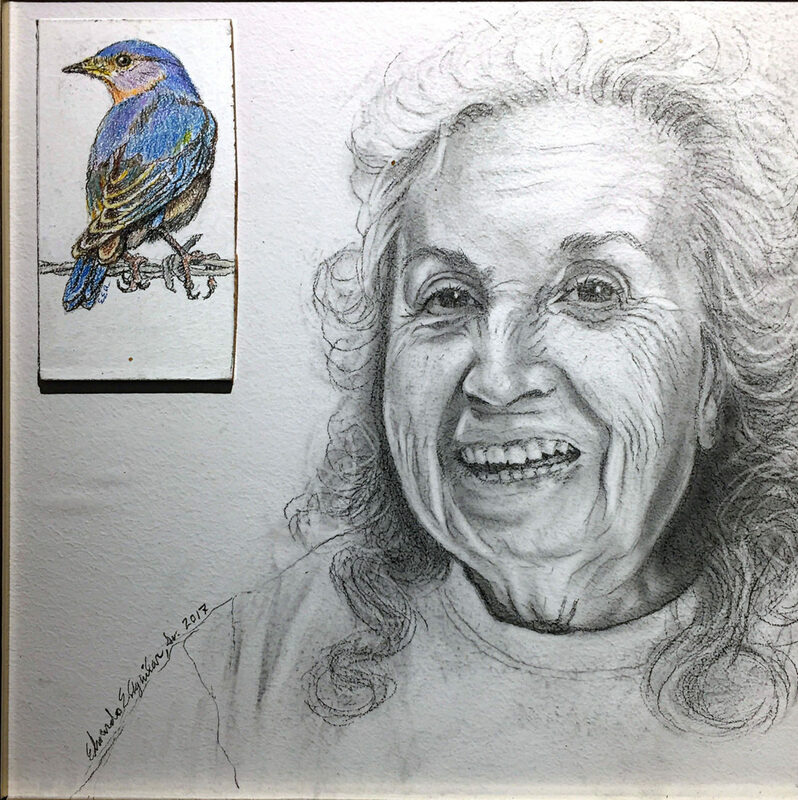 "Eduardo E. Aguilar Sr._Cicada" by Eduardo E Aguilar Sr.
“Estella Aguilar_Bluebird” by Eduardo E. Aguilar Sr.
“Andrew Gill_Blue Jay” by Eduardo E. Aguilar Sr.
“Alejandro Garza_Glass Wing Butterfly” by Eduardo E. Aguilar Sr.
“Cordelia A Wilder_Kawinsky Beauty” by Eduardo E. Aguilar Sr.
“Eddie Sandoval_Horned Toad” by Eduardo E. Aguilar Sr.
“Celia Munoz_Palid Tiger Swallowtail Butterfly” by Eduardo E. Aguilar Sr.
Eduardo E. Aguilar Sr. knows how to capture a likeness. On display at the VAM Gallery at South Texas College, “Characters & Creatures” demonstrates his longtime artistic passion — portraiture. 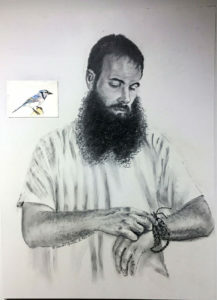 There are 23 graphite and Prismacolor drawings in this show with all but two concerning the entire torso of the subject. A native Texan, Aguilar has been doing portraits of family and friends since elementary. The work in this exhibition is a revised theme first explored during the artist’s graduate Master of Fine Arts show at the University of North Texas. For “Characters & Creatures,” the single portraits of family, friends and colleagues are juxtaposed with small, life-sized creatures such as insects and birds. While the portraits are achromatically graphite, Prismacolor was used to emphasize the small creatures. 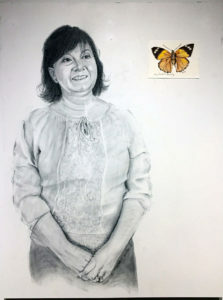 Aguilar jump-started this project by asking his family, friends and colleagues if they would volunteer to pose for a portrait and to choose a small creature they wanted juxtaposed with their image. The original thought included life-sized characters and creatures. Because each portrait would be limited to a 30 by 40-inch space, the life-sized creature needed to be small enough not to crowd the composition of the figure. 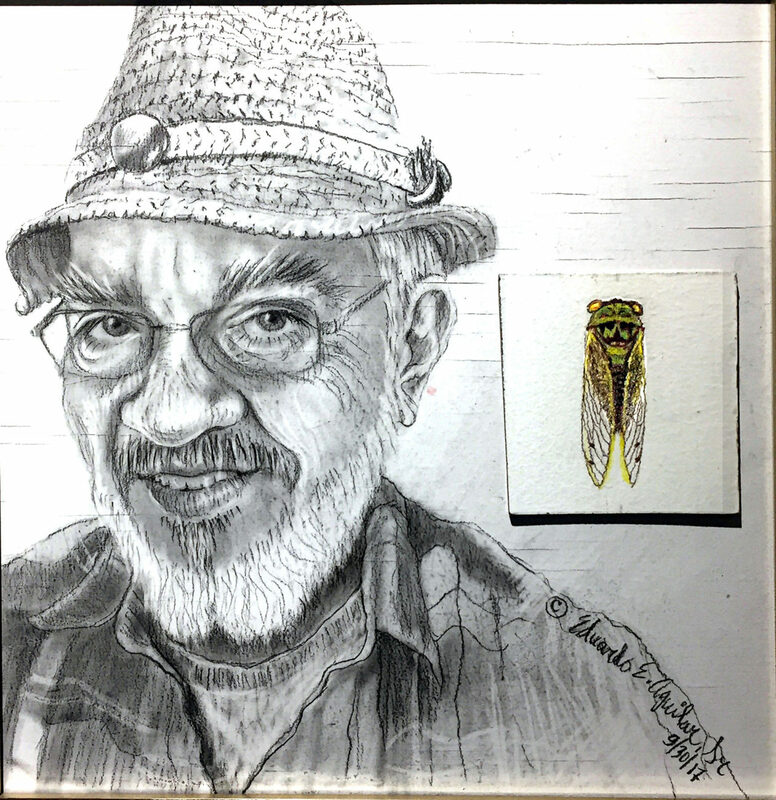 In these portraits, small colorful creatures balance the larger graphite image. Aguilar’s subjects are presented objectively and, although there are clues to personal interests in some of the pictures, they are not readily deciphered. For instance, printmaker Lenard Brown is shown perusing a book. Overall, Aguilar’s drawings represent a content society; these are basically happy people. And while we aren’t told how each creature relates to its character, a few were explained to me. A portrait of his aunt shares space with a long-legged spider. She said that she was very tall in school and other kids called her daddy long-legs. Lenard Brown is identified with a scorpion, his astrological sign. Cat lover Richard Smith, an STC instructor, is shown with one of his cats. Only the cat’s photographed face is shown because the size of the entire animal would have disturbed the composition plan. 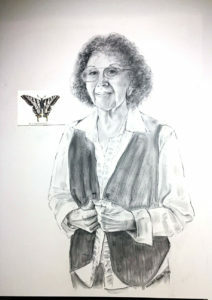 Similar to Smith’s cat, there is one other creature that appears as a photograph rather than a Prismacolor drawing, “Alejandro Garza/Glass Wing Butterfly.” When Garza was in a forest in Argentina, the butterfly landed on his hand and he photographed it, possibly a little homage to the photograph. Graphite has been a long-time medium of choice for Aguilar. His technique is traditional, but there is a subtle, unique styling in his treatment of shading. Flat areas of softened tone exist adjacent and sometimes under the linear strokes. Occasional erasure marks produce light lines over tonal surfaces producing a richer effect, and often dramatic highlights. 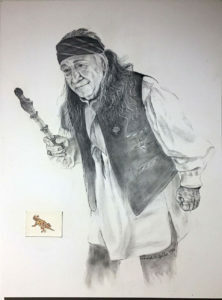 These effects are notable in the portrait, “Eddie Sandoval/Horned Toad.” Here, white strands were created in his hair and his face shows a subtractive modeling technique. 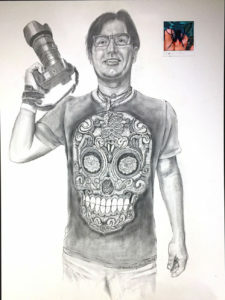 As Professor and chair for Tarrant County College’s Visual Arts Department until 2013, Aguilar still sees himself first and foremost as an educator. Nancy Moyer, Professor Emerita, UTRGV, is an art critic for The Monitor. She may be reached at nmoyer@rg.rr.com.